by Henry Mintzberg, Bruce Ahlstrand and Joseph Lampel. There are almost as many approaches to the field of strategy, as there are authors who write about that subject. You may be attempted to think that every aspiring author hopes to come up with the one and only concept that makes him a famous strategy guru. The result is an ever-growing body of knowledge about strategy. This vast amount of information – which often is contradictory – may be overwhelming for the interested layman. For each school, they describe its basic assumptions and approaches. They also place it into its respective historical context, which is very important for evaluation its validity today. Of course, they also provide examples and list the schools’ contributions and limitations. When reading through these descriptions and critiques, I often got the feeling that the authors virtually had fun writing about their colleagues’ ideas and finding the weak spots from the hindsight. Hence, the book is an entertaining read, despite the complex subject. 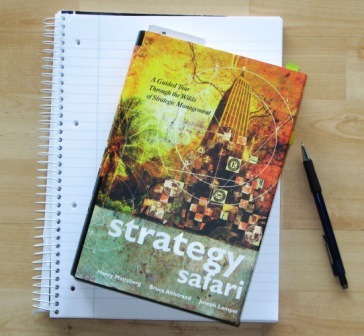 The book gives an excellent overview on the wide field of strategy. It does some groundwork in explaining what strategy is all about and it introduces the most important concepts and contributors. 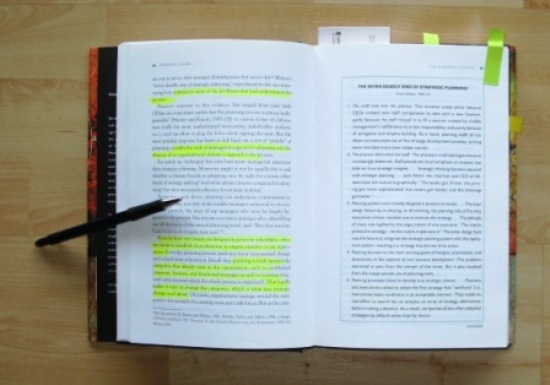 The book helps you to make sense of whatever approach to strategy you may come across. It enables you to relate a particular approach to one or more schools of thought. Which what you’ve learned about these schools, it is much easier to form an opinion about that particular approach. This last aspect makes the Strategy Safari one of my preferred reference books. Below is the proof that I actually work with this book. Reference books can be a fun read too!